As of January 2011, UNHCR-Georgia estimates that approximately 359,716 IDPs continue to live in Georgia proper. Preliminary survey results from the 2011 Caucasus Barometer show that Georgian attitudes towards IDPs are generally positive. More than half of Georgians support government assistance for IDPs, and view IDPs as part of Georgian society. Results indicate that Georgians would like to see an increase in government assistance. 57% of Georgians say that the current level of assistance is not enough, while 18% claim it is. 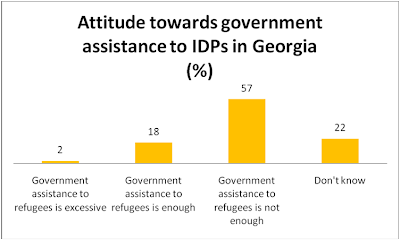 22% of Georgians do not know if the current level of government assistance is meeting the needs of IDPs and only 2% consider the current policy of assistance to be excessive. The survey refers to all IDPs in Georgia, not only those from Abkhazia or the Tskhinvali region of South Ossetia. Over half of Georgians (61%) consider IDPs to be part of Georgian society. 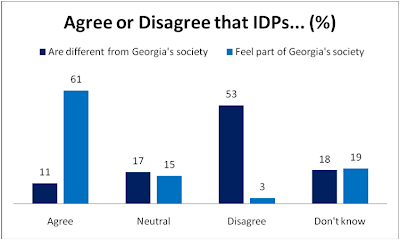 In addition 53% of Georgians disagree with the statement that, “IDPs are different from Georgia’s society”. Data was recoded from a 5 to 3 point scale and the scale was reversed.The original scale comprised of strongly disagree=1, somewhat disagree=2, neutral=3, somewhat agree=4 and strongly agree=5. On the whole, results indicate that Georgian attitudes towards IDPs are supportive. For those with further interest in the question, various crosstabulations should be of interest once the dataset is released. Also, click here for previous research CRRC has done on this topic. This is only a quick preview of the results from the 2011 Caucasus Barometer, keep checking back for more information and the upcoming release of our results on ODA!